From time to time my friends and I like to get free bikes, find a river or stream, and bike alongside it. We all get so excited that we are using really nice bikes without paying for them that we forget that what we are doing actually counts as exercise. Anytime we do remember, we stop and get some ice cream, subs, or samgyeopsal (삼겹살). Which bike should I pick? There are other free things to do in Seoul, but many aren’t worth mentioning. Lot of them are one time deals. Well, they aren’t just for old people. No one will yell at you if you use them. But, the exercise equipment in parks tend not to have very much resistance so they will only benefit the old and weak. There are many types of machines. Some are hard to figure out. Like the one above, who’s only purpose seems to be flipping people upside down. You can go to any given park in Seoul in the morning or evening and see herds of old folks twisting and swinging themselves as they gossip and complain about their grandkids. I don’t speak Korean well enough to know for sure that they are talking about their grandkids. I just know old people and they’re all the same really. Some parks do have more serious gym equipment like weights. You might see a bench press just out in the open. Some have the barbells chained to the bench press. Others have the weights in an unlocked shed near by. No one seems to use them except for curious foreigners like my friends and me, looking for a photo-op. There are many spots along the Han River that lend out free bikes. There are also places that will rent them for a fee. You just have to know where the free places are. I know of three. You may think that the free bikes would be old crappy bikes, but your assumption would be wrong. Most of the free bikes are quiet nice and many of them are new. The ones in Nowon still had some of their plastic wrapping on them when we went there. 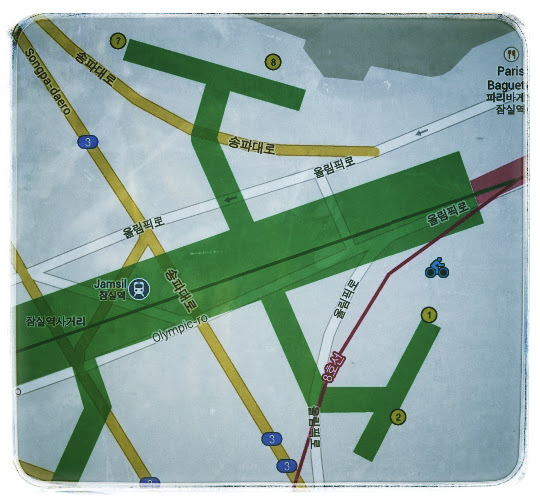 It’s near exit number 1 of Jamsil station. It’s across the street from Quizno’s and it looks like the picture on the right. 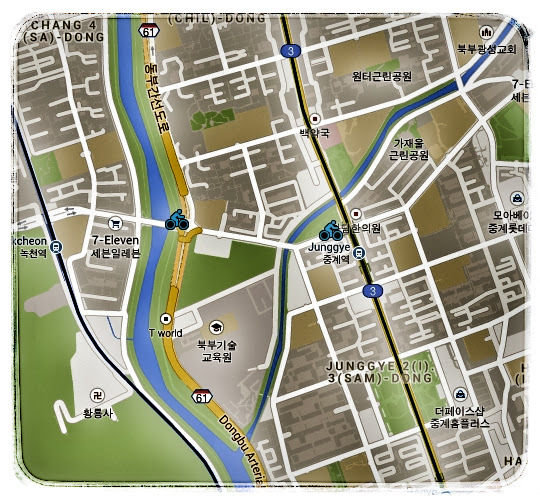 You can go to either Junggye station or Nokcheon station and follow the map below to either bike place. These bikes are newer than the ones in Jamsil. One of the bike houses was just built in February (2009). Here are some others. I don’t have any first hand information about them, but here is what I found out online. You can have the bike for 3 hours. Just bring a photo ID like your ARC or a driver’s license from any country and a phone number for a cell phone that you should have on you in case they need to call you. At Nowon, Tom found that sweet talking will do if you have forgotten to bring an ID card. But unless you’re as charming as Tom, don’t count on it. Hours: It depends on the bike rental place. Both Jamsil and Nowon places allow you to use the bike as long as you like provided that you bring them back by closing time. The bikes are first-come, first-served. Not many people use these free bikes, so there are usually many to choose from. The free bike place in Nowon near Nokcheon station had bikes for handicapped people too.